Hotel Duval, the first and only boutique hotel in Tallahassee, presents Florida and Georgia residents 30 percent savings with its Summer Sizzle package Thursdays through Mondays, now until July 31. Hotel Duval, the first and only boutique hotel in Tallahassee, presents Florida and Georgia residents 30 percent savings with its Summer Sizzle package Thursdays through Mondays, now until July 31. The $99 Summer Sizzle package is based on select guest rooms and includes complimentary valet and two welcome cocktails upon arrival. Summer staycationers looking for a cultural escape combined with upscale, urban experiences and eco-tourism, enjoy Hotel Duval. 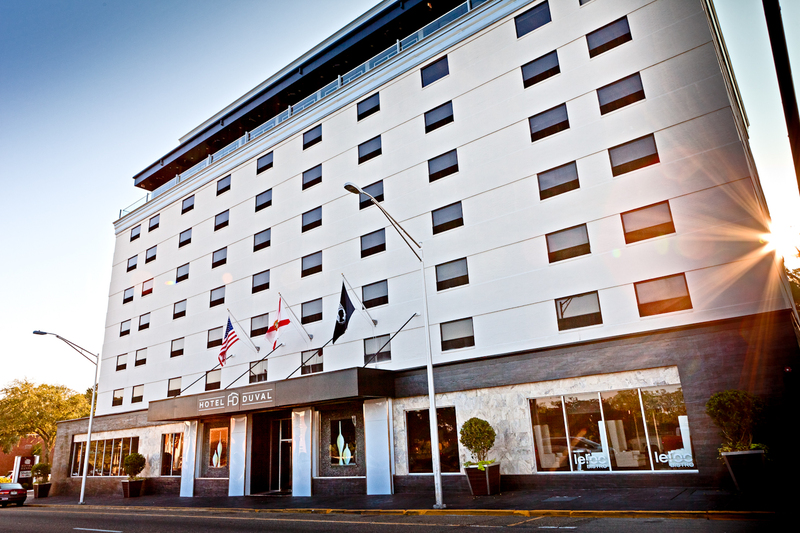 Located three blocks from the heart of downtown Tallahassee, Hotel Duval is walking distance from the state’s capitol while Florida State University and Florida A&M University are within five miles. From parks, gardens and canopy roads to freshwater fishing, manatee-sightings and canoeing, Hotel Duval is near historic museums and downtown attractions. Home to Shula’s 347 Grill, a sports-style steakhouse offering, “The Best Beef that Money Can Buy,” flows seamlessly with the vibe and décor of the property. Hotel Duval’s signature restaurant presents options of gourmet salads, fresh fish and exclusive Premium Black Angus Beef Burgers and Shula Cut Steaks. Hosting a street-level café, LeRoc, which features Starbucks coffee and locally grown and sourced food is open for breakfast and lunch. Level 8 is the only rooftop lounge of its kind from Atlanta to South Beach. Comprising both open-air and indoor elements, Level 8 of Hotel Duval showcases panoramic views of the capital city with live entertainment. With 117 rooms and suites, all offering experiences that heighten each one of the five senses, Hotel Duval is adorned in European boutique décor with an artistic ambiance. The hotel ornament is contemporary, yet comfortable providing down-to-earth atmosphere with a contrasting backdrop of the historic landmark. Each floor at Hotel Duval has a unique personality with associated color therapy and aromatherapy. Guests may select what floor they prefer to reflect their mood and purpose of stay by the color and scent options. With distinctive design, amenities and approachable luxury, Hotel Duval brings vibrant energy to Florida’s capital. To purchase the Summer Sizzle Package, visit http://www.marriott.com/hotels/travel/tlhak-hotel-duval-autograph-collection/ and use the booking code: D3Q or call 888.717.8854 and ask for the Summer Sizzle package. To learn more about Hotel Duval, visit http://www.hotelduval.com or call (850) 224-6000. Hotel Duval is a part of the Autograph Collection, which is an ensemble of high-personality and boldly independent hotels, each carefully selected for its distinctiveness, style and synchronicity with unique travel interests. For more details, visit http://www.AutographCollectionHotels.com or visit http://www.hotelduval.com or call (850) 224-6000. Find Hotel Duval on Twitter and Face Book for additional promotions. MARRIOTT INTERNATIONAL, INC. is a leading lodging company with more than 3,400 lodging properties in 70 countries and territories. Marriott International operates and franchises hotels under the Marriott, JW Marriott, The Ritz-Carlton, The Autograph Collection, Renaissance, Residence Inn, Courtyard, TownePlace Suites, Fairfield Inn, SpringHill Suites and Bulgari brand names; develops and operates vacation ownership resorts under the Marriott Vacation Club, The Ritz-Carlton Destination Club, and Grand Residences by Marriott brands; licenses and manages whole-ownership residential brands, including The Ritz-Carlton Residences, JW Marriott Residences and Marriott Residences; operates Marriott Executive Apartments; provides furnished corporate housing through its Marriott ExecuStay division; and operates conference centers. The company is headquartered in Bethesda, Maryland, USA, and had approximately 137,000 employees at 2009 year-end. It is recognized by FORTUNE® as one of the best companies to work for, and by Newsweek as one of the greenest big companies in America. In fiscal year 2009, Marriott International reported sales from continuing operations of nearly $11 billion. For more information or reservations, please visit our web site at http://www.marriott.com, and for the latest company news, visit http://www.marriottnewscenter.com.